Solder is flowing. Torches are glowing. The sweet aroma of hot patina and buffing compounds fill the studio’s air! The Miami Metals 31st Annual Jewelry Sale is near! This is your chance to find that unique holiday gift! Or treat your self with adornment for your next night out! The students have you in mind with their creations. This year's sale will take place beginning Tuesday, Nov. 17, continuing through Thursday, Nov. 19, 2015. The sale is located in the Armstrong Student Center; the Slant Walk (across from Emporium), with hours daily from 10:00 am – 7:00 p.m. 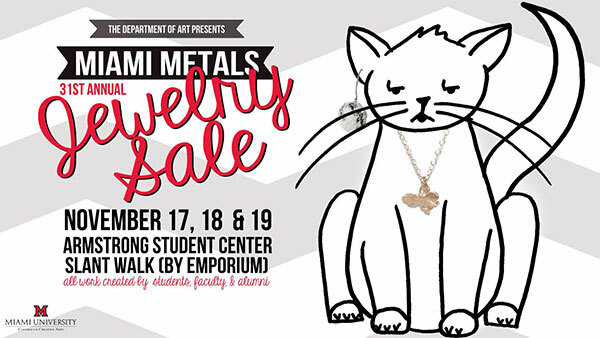 The annual Miami Metals Jewelry Sale, is a student-led entrepreneurial, design practicum featuring the unique designs of Miami Metals’ students, faculty, and alumni. Featured are one-of-a-kind art jewelry, ranging from the traditional to the unexpected. All inventory is skillfully crafted using traditional hand-processes and state-of-the-art techniques, utilizing silver, copper, and steel that has been transformed into wearable art. Rachel Keppeler, a major in Studio Art, is one of many students who will be featuring jewelry designs as part of the sale. "This year the sale will feature many new techniques," said Keppeler. "Shoppers can expect to see more laser-cut leather, in addition to materials that are casted and enameled." Rachel also stated that she has enjoyed incorporating her own designs from the jewelry business that she owns and manages. "Copper the Cat" is the featured icon of the 2015 sale. Art majors Annelise Bennig and Emily Duso comprise the advertising team duo who conceived and designed the cat. "The cat is featured daily with different themed posts for Miami Metals on both Facebook and Twitter using #jewelrysale31," said Bennig and Duso. Copper the Cat will also be featured as a large cut-out during the sale so that attendees will be able to take a selfie with the cat." Jack Keegan, biology instructor and the greenhouse manager at Miami, has been a devoted customer at the sale for many years. Each year he buys gifts for each of his sisters for the holidays. "Our family loves the uniqueness of the products. Each of the pieces are truly one of a kind, and all derived from nature. This sale is always such a wonderful experience!" stated Keegan. Proceeds from Miami Metals Jewelry the sale support the enrichment of the student/studio experience including the support of visiting artists/lecturers, purchasing special tools, supplies and supplemental materials, going on special art-related excursions, workshops and trips abroad. 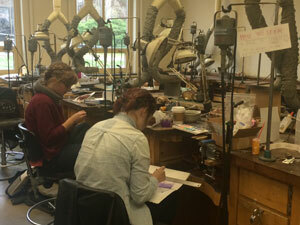 To learn more about Miami Metals and Jewelry Design, visit the Department of Art website.